This week I would like to introduce you to Sophia. Sophia’s blog is one I stumbled upon quite recently and her blog is one of my Friday Favourites, not only because I like to read her posts, but the sheer dedication Sophia has to her blog. Sophia posts on her blog daily, her blogs are lengthy and informative, which I really appreciate as I think it would be easy to post on a daily basis if you were willing to post half-hearted posts. I got talking to Sophia on Twitter recently and she is a really lovely girl, which is another reason she is one of my Friday Favourites. 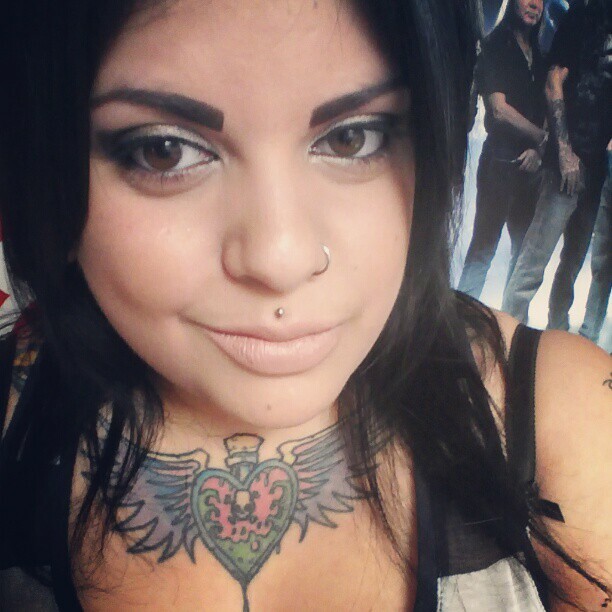 Sophia loves music, tattoos and tea, hence her blog name ‘Tattooed Tea Lady’. Sophia has just posted her first video blog, and one of the first things she said is that she hasn’t previously done them as she is not confident about the way she looks. This annoys me. Not Sophia, but the fact she feels this way. She is a beaitiful girl in her own unique way just like you reading this, and me writing this. We are all beautiful. Sorry for the girl power but enough girls are happy to slag off other girls and I seriously detest this. Anyway, the content of Sophia’s blog – everything! Beauty reviews, recommendations, blog sale and the first thing that caught my eye ‘the 100 day challenge’. Sophia has challenged herself to not spend anything for 100 days, there are exceptions such as underwear and beauty boxes, but this is a challenge I know for a fact the majority of us would struggle with. Sophia regularly updates us with her progress. So yes ladies, in summary, follow Sophia’s blog and her Twitter, she is a great girl and has a great blog. My blog is a little space for me to write. Whether it is about beauty, products I love, books I’ve read, new things I’ve tried, or a little bit about my life. It’s somewhere for me to escape and something I find very relaxing and therapeutic. A little peaceful haven, if you’d like. What is your favourite beauty product & why? I think this deserves a few answers. Because to choose just one would be unfair! My favourite make up product right now, is the Urban Decay Naked 2 palette. It’s fairly new in my collection, but since buying it is has become my go-to palette on most days, I adore it! My favourite skin care product right now, is my Good Things blackhead exfoliator. I have terribly large pores which get clogged so easily and this has just been working miracles with my skin and pores! And last but not least, my favourite body product right now is probably my Garnier gradual self-tanning lotion. I think I might be addicted to the smell, and I love how it gives me such a natural glow! What is your favourite scent & why? I really like zesty scents and right now my absolute favourite scent is the scent of Burt’s Bees lemon butter cuticle cream. It’s the perfect zesty lemon scent and I adore it! I’m not too sure I actually have a beauty icon – I don’t really have much to relate to in popular icons, as I’m quite a heavily tattooed lady. But one lady I do adore and always admire for the way she presents herself is Dita Von Tease. She takes classic, natural beauty to a whole new level and is quite possibly one of the most beautiful women on this planet! Can you share a beauty secret with us? Not quite a secret, but more a few words of gentle persuasion. Skincare. I know it can be a chore for some people, and a lot of people don’t bother. But I could not recommend enough, having a good skincare routine. You can mask your skin tone, complexion and texture with make-up, but your skin will still be there and if you don’t look after it, down the line it will begin to show. My morning and evening skin care routine is my absolute favourite thing to do. I take care of my skin, I enjoy all of my products and it leaves me feeling relaxed, clean, and generally feeling a lot better about myself. Look after your skin, because the longer you leave it, the harder it will be to mask. And the more you do look after your skin, the less products you have to use, as well as your make up looking more naturally flawless, too! What beauty advice would you give to your younger self if you went back in time? I was the opposite of a beauty enthusiast as a teen. Advice I would give to a younger Sophia, would be to not shy away from hair brushes; looking like you’ve been dragged out of a bush backwards is not the look to go for! And to avoid at all costs any make-up recommendations from my mother, whose obsession with me wearing blue eye-shadows and blue eye-shadows alone, did me no favours! If you could create a beauty product, what would it do? A product I dream of every day! A product to completely and utterly rid me of my oily skin! But such products don’t exist and if they did, I’m pretty sure it would only be available in Diagon Alley. Nice post, I agree Dita is fab!